I have been a fan of mind maps for about a year now, and use them for academic through to life endeavours. Ideas and their relationship within a broader web of ideas are clearly identifiable. Allows for the easy addition of new information and are essentially open ended. Allows you to see the big picture, but also drop down into the ‘nitty gritty’ detail. 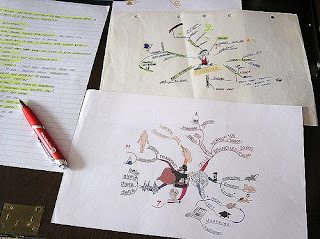 Mind Maps are more visual than lists or dot points, which tends to make them easier to remember. If you understand something in only one way, then you don’t really understand it at all. The secret of what anything means to us depends on how we’ve connected it to all other things we know.Well-connected representations let you turn ideas around in your mind, to envision things from many perspectives until you find one that works for you. And that’s what we mean by thinking! All in all, mind maps are a more natural way for structuring our thoughts. Mind Maps achieve such a high degree of effectiveness, as they tend to stimulate more regions of the brain than just the typical chronological based notes. The web of ideas allows us to have mutliple avenues by which we can reach the same destination. I also feel that Mind Maps to some degree address the issue of information overload. They tend to be more succinct, but ultimately it depends on the author. Thanks to Web 2.0 it is also now easy to share mind maps and thus build up a large web of information. Whilst not directly related to this topic, Life in the Fast Lane provides more information on dealing with this growing problem of information overload. It would be interesting to see, in the future rather than a linear service like Wikipedia, a mind map that forever expands and shows the links between a variety of topics. Of course, this would demand heavy processing power, but I think it would be a better way of presenting information to the masses. The most simple of tools is a piece of paper and a pen, however I’m pretty sure most people could work that out for themselves, so I will move onto software. I can recommend Freemind as a good mind mapping program. It’s free and certainly provides a reasonable interface for mind mapping. I currently use a program called XMind which is a more refined piece of software. It accepts most common file formats (for mind maps), and even better has an online collaboration service known as Share.XMind.net. The minor downside for some, is that this program requires you to register (i.e. with an email address). XMind is also open source and free for use. A pro version is offered for those with greater needs. A nice post summarising a bunch of tools is 50 useful mind mapping tools for college students. If you are not happy with the software I’ve recommended take a look through this and find something that better suits your needs.